Like many folks, I’ve kept tabs on the LeBron James saga. I’m not a fan of basketball, I personally could care less he chose the Heat over the Cavs. I was interested to see what, if any, societal fallout would occur if he did leave Cleveland. For the most part, fans reacted predictably. It’s safe to say if “King James” ever returns to Cleveland, he better do so with a legion of armies in tow! Hate often flows unabated from Rev. Jackson’s mouth when he sticks his nose where it doesn’t belong. However, I agree that Mr. Gilbert’s comments were “mean, arrogant and presumptuous.” I believe the letter as a whole was unwarranted and unnecessary. Like a little child throwing a temper tantrum, Mr. Gilbert lashed out simply because he couldn’t get what he wanted. Rev. Jackson rebukes Mr. Gilbert for speaking “as an owner of LeBron and not the owner of the Cleveland Cavaliers.” In doing so, Rev. Jackson shows just how out of touch with reality and business he truly is. In owning the team, Mr. Gilbert owns all assets of that team. This includes players and LeBron James when he was under contract. We, as a people, tend to dismiss the demeaning notion that we are nothing more than an asset as that makes us no different than the machine or computer we work on. The harsh reality is business views anything that affects the bottom line as an asset, too include its workers. If you work for someone, you are an asset, and therefore you are owned. Rev. Jackson’s assertion that Mr. Gilbert’s, “feelings of betrayal personify a slave master mentality. He sees LeBron as a runaway slave” are simply unfounded. There’s absolutely nothing to suggest Mr. Gilbert’s comments were racially charged. There’s nothing (that I’m aware of) in Mr. Gilbert’s past behavior that suggests race played a role in his letter. 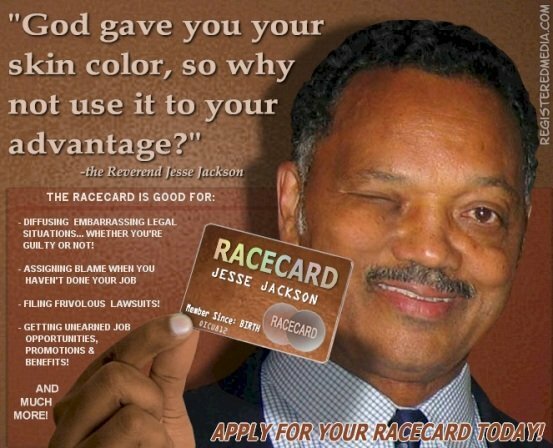 As a result Rev Jackson based his remark on his personal perception of racial injustice, and not racial injustice itself. That is both sad, wrong, and dangerous. I shouldn’t be surprised that Rev. Jackson has interjected himself into a situation that doesn’t warrant his presence. He does it all the time. Nor am I surprised he played the race card on what he perceives as racial misconduct. This is a man whose sole existence is grounded in the issue of racial injustice. Were it not for this cause, no one would know nor care who Rev. Jackson is. Sadly, in his struggle to satisfy his ideal of self importance, it’s not too farfetched to believe Rev. Jackson’s comments were nothing more than a ploy to elevate him to the forefront of current public limelight. Rev. Jackson’s latest and past actions highlight two shortcomings in the bigger picture of overcoming racial discrimination. First, if you look hard enough for something, you will find what you are looking for, even if it does not really exist. Perception can be dangerous. Racial discrimination based on perception, and not fact, only serve to reinforce preconceived racial stereotypes and beliefs. This serves to fuel, not extinguish, the fire of racial discrimination. Finally, most of those who dedicate their lives to fighting racial injustice do so selflessly and honorably. Unfortunately, there are some who do so to satisfy their own personal gains. Whether due to fame, fortune, or ego, it is those like Rev. Jackson that have the most to gain by ensuring racial discrimination remains alive, well, and profitable. Racial discrimination cannot be overcome until all honorably take up the cause.